Heightened sensitivity to failure and negative information is thought to be an important maintenance mechanism for symptoms of depression. However, the specific neural and behavioral correlates of the abnormal reactions to errors associated with depression are not yet well understood. 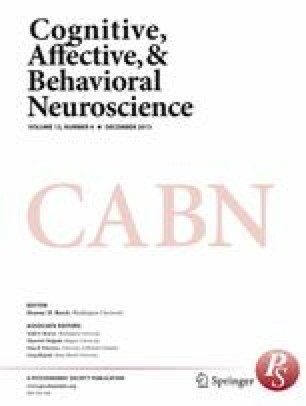 The present study was designed to shed new light on this issue by examining how depressive symptoms relate to error monitoring in the context of different task demands. We used a modified flanker task in which the stimulus–response (S–R) mappings were reversed between blocks, differentiating relatively easy nonreversal blocks from the more-demanding S–R reversal blocks. Undergraduates performed this task and then completed a self-report measure of anhedonic depression. The results revealed that depressive symptoms were related to poorer posterror accuracy in the more-difficult S–R reversal blocks, but not in the easier nonreversal blocks. Event-related brain potentials (ERPs) within a subsample of these participants further indicated that depressive symptoms were associated with reduced error positivity (Pe) amplitudes in both block types, suggesting that depressive symptoms were related to reduced attention allocation to errors across the easy and hard blocks. Finally, brain–behavior correlations indicated that highly depressed individuals failed to display a relationship between Pe amplitude and posterror accuracy in the S–R reversal blocks, a relationship that was intact in the low-depression group. Together, these results suggest that task demands play a critical role in the emergence of error-monitoring abnormalities in depression. The online version of this article (doi: 10.3758/s13415-013-0184-4) contains supplementary material, which is available to authorized users.